A warrior originally found sitting on the path between Majula and the Shaded Woods. Benhart came to Drangleic from a far eastern land called Jugo. He is quite attached to his sword, the Bluemoon Greatsword (not to be confused with the Moonlight Greatsword) which he states has been passed along through his family for generations. He is very proud of his heritage and sword, although it is speculated by Magerold of Lanafir that the sword itself is unfortunately a fake. Before the entrance to the area, sitting on the path waiting for someone to clear the path. After opening the path, he teaches the player the "Joy" gesture. Sitting next to the Central Castle bonfire. Sitting in front of the fallen giant past the Pursuer's boss arena. Sitting right in front of the player's spawn, next to the stairs. At the Royal Army Campsite in one of the nearby tents. Right before the Looking Glass Knight fog wall. At the bottom of the stairs before the fog door. Summoning Captain Drummond will prevent the summoning of Benhart and vice versa. To the left of the fog wall. Between some rubble on the opposite side of the room from the fog door. Can be summoned for various boss fights. Exhaust all of his dialogue in all four encounters with him. Summon him at least three times for boss fights and have him survive the boss fight. NOTE: You can win the three boss fights by battling the same boss multiple times by the use of a Bonfire Ascetic. For example, you could have him fight Prowling Magus & Congregation twice and then Looking Glass Knight once and that would count as three wins needed for him to give you the equipment. Benhart is first encountered at the entrace to the Shaded Woods where he speaks to you about a statue that is blocking his path. You will need a Fragrant Branch of Yore to unpetrify the statue who turns out to be Rosabeth of Melfia. Speak to him after unpetrifying Rosabeth and he will thank you and plea to help you in your journey. He can now be summoned for help. If you continue past the Shaded Woods you will eventually end up in Brightstone Cove Tseldora. His summon sign is found in a tent which has a target dummy. It is recommended to clear the path to the Prowling Magus & Congregation fog gate before summoning him, as he can fall off a cliff or get crushed by the boulders when chasing after enemies. Next he can be encountered in Drangleic Castle next to the Central Castle bonfire. Exhaust his dialogue here to be able to summon him for the Looking Glass Knight boss fight. His summon sign is located right in front of the boss fog gate. His next hangout is in the Forest of Fallen Giants right next to one of the fallen giants past the Pursuer's boss arena. After exhausting his dialogue he will go inside the giant right next to him and enter Memory of Orro. Speaking to him in the Memory allows him to be summoned in Memory of Jeigh for the Giant Lord boss fight. Be warned, summoning Captain Drummond for the Giant Lord prevents you from summoning Benhart. He will stay in Memory of Orro, he will not move or disappear. His last summon sign is right outside of the fog gate in Throne of Want. He can be summoned for both the Throne Defender and Throne Watcher and Nashandra boss fights, though only the Nashandra boss fight counts towards the three required fights. Based on this it may be wise to, after defeating the Throne Defender and Throne Watcher, to save & quit to the main menu so that you can freshly summon Benhart for Nashandra. 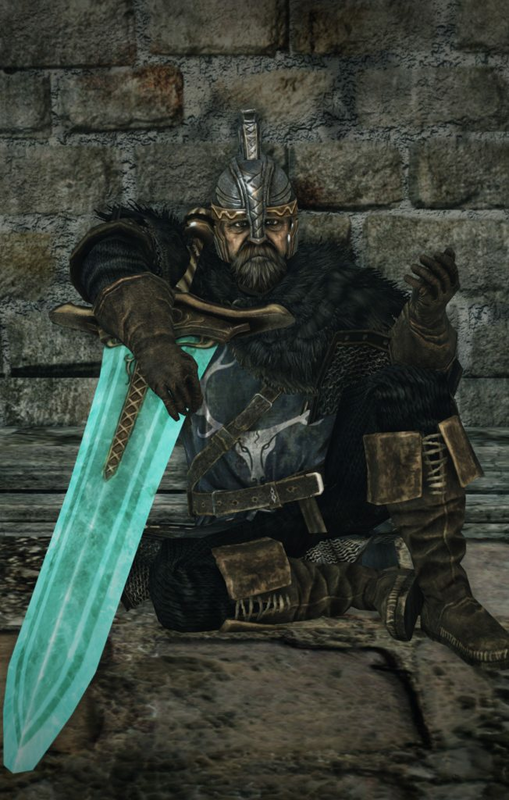 You can go back and speak to him in Memory of Orro or Drangleic Castle to receive his equipment. You can summon Benhart for the DLC boss Elana, Squalid Queen. This also counts for his quest line. If one speaks with Maughlin the Armourer with the Bluemoon Greatsword in their inventory he will confirm that the sword is indeed a fake. Have you business with me? The way yonder's all blocked up you see. By this god-awful statue. Heavens above. Who thought it a good idea to put it there! Ohhhh, I'm in quite the pickle now. See that statue? Gives me the willies. Stare at it for long enough, it starts to look alive. Ach, It just does nae seem quite right. There are no craftsmen round these parts. Hey, you don't think a real-life person was turned to stone, do you? What?! Clearing the way was your doing, was it? Haah, didn't think you had it in yer pal. No no no. That's not like it sounds, you know! It was a pleasant surprise, that's all. Name's Benhart. Thanks to you, I can resume my journey. If we share the same path, I'm sure that we are gonna meet again. I'll repay my debt to you in battle. And I swear it by my sword. The road ahead's gonna be long, but I'm here to help. Gah hah hah hah hah! I am in yer debt. It's a true man who honours his debts. And I'll see mine paid. I swear it, by my ancient sword. Good to see you well. Yes, hehh hehh, very good indeed. I journeyed from the distant east to perfect my swordsmanship. Legend has it that powerful beings slumber in this land. This sword, it's been in my family for generations. And only a real man can wield it true. This land is a right mess, eh? King's gone, and the people have a mad glint in their eyes. The land itself is overrun by terrible beasts. Well, we meet again! What you doing here? Who'dve thought we'd meet in a place like this. Fate just won't let us stay apart, will she? Gah hah hah hah hah hah! See the old sword's caught your attention? Well, you've a good eye, then. Ah, it's been in my family for generations. They say it is crafted with moonlight, and we all know what that means, it wards off evil. And I would nae trade her for all the riches in the world. They say that no man has ever teased oot the sword's true power. I see you've taken a liking to the sword. Well, I applaud you, for you've a sharp eye. But this is one sword pal that I will nae be giving up. Then you will have to pry it from my cold hands! Gah hah hah hah hah hah! I've a great debt to you. And I'll never forget it. I, Benhart, swear by my honour, to aid you in your darkest hour! So nae problem pal. Oh! Look at you! Old friend! I see yer travels weigh upon you yet. Just remember, I'm always ready to help. My homeland is in the far east. A kingdom of honourable fighting men. And this sword yet awaits a true man to wield it. I know how swords think, you see! Gah hah hah hah! We have outwitted death a good many times. Huh huh, My dear friend, take these. Very well. I, Benhart, will be honoured to chop you to pieces.